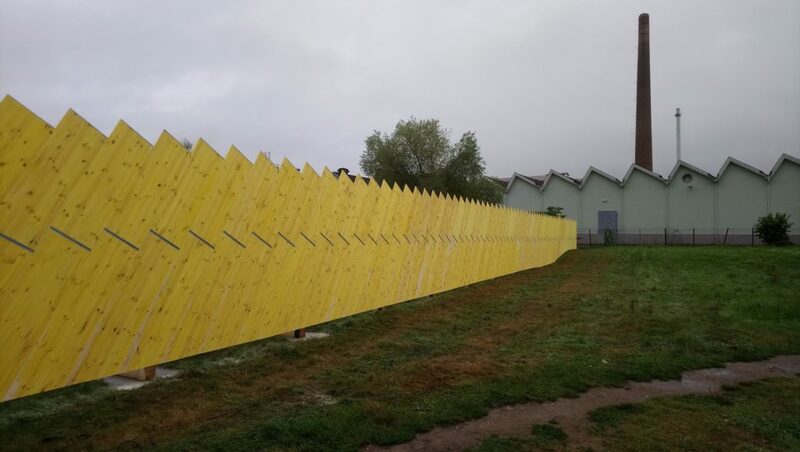 Artist Margit Czenki has started work on an unusual construction fence in Lörrach. Weaving together the local and the global, her subtle, yet gigantic work contains a secret message. 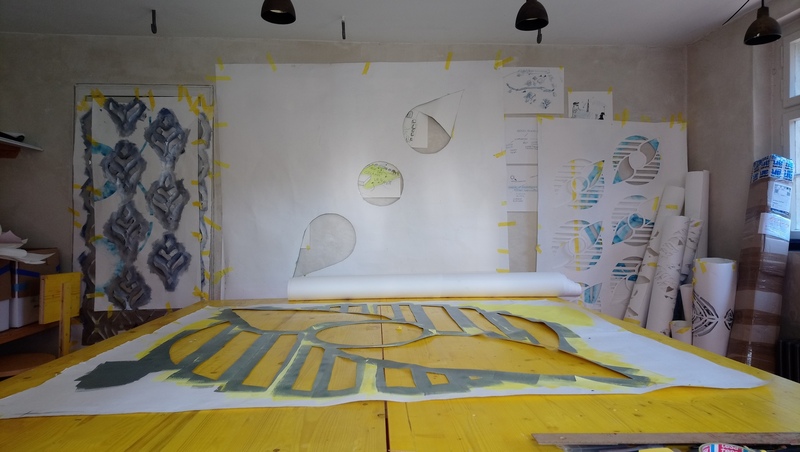 View into Margit Czenki’s improvised stencil studio in Schöpflin Foundation’s temporary studio, the minifabric. Czenki is the first artist commissioned and at work for the new FABRIC project. The artist participated in documenta 11 with Park Fiction. She has exhibited her work in shedhalle Zürich, Kunsthaus Dresden and in Museum Villa Stuck. Her movies were presented in New York’s MOMA and in Zürich’s Schiffsbau. In the 80ies, she founded the women’s film archive faf in Hamburg. 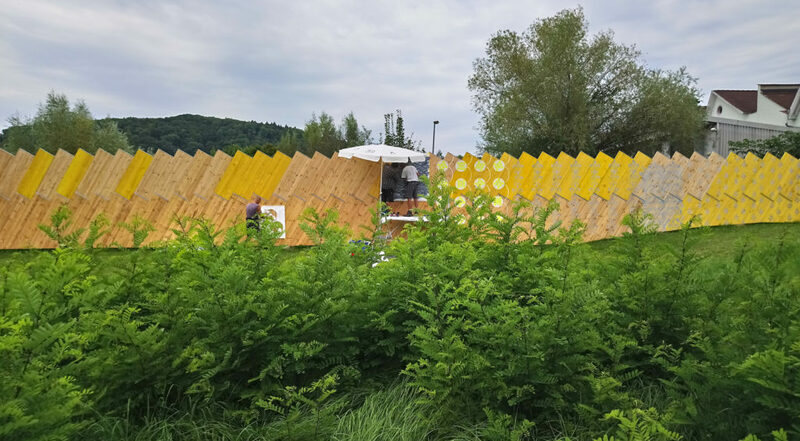 She art-directed the ContainerUni in Friedrichshafen, heavily using stencils there for the first time. The artist recently co-founded the much talked about PlanBude project in Hamburg. 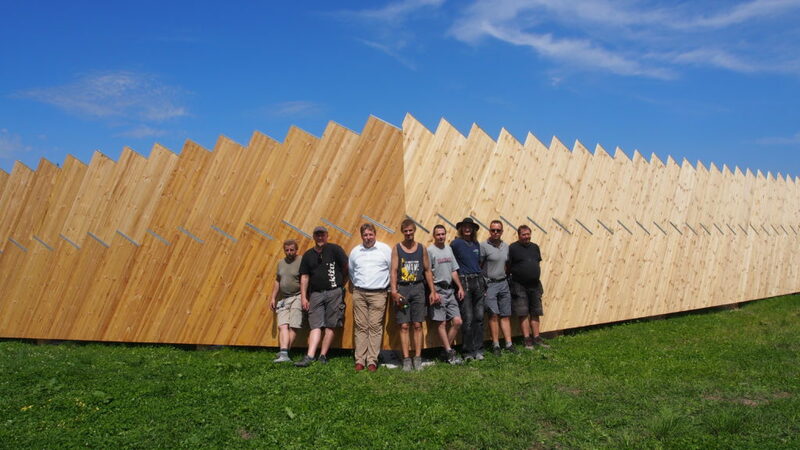 Quoting the shed roof design of the neighbouring factory, a fence has been built, that some people already call the most beautiful construction fence in Europe. Carefully built, like a backdrop for a theatre play, the fence appears like a piece of faux-architecture. If you come closer, you can see tender patterns in silver and yellow tones, ornamenting the structure like a festive curtain. 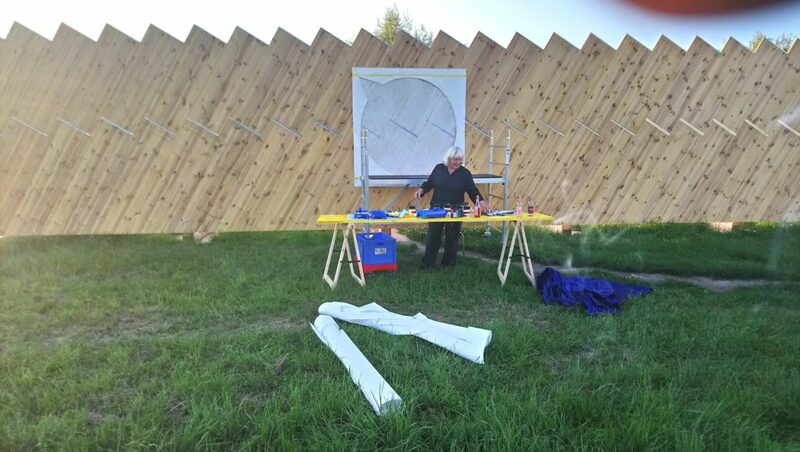 Consequently Schäfer invited artist Margit Czenki to further work on the fence. „The form of the fence designed by the FABRIC Team refers to the architecture of the factory next door. I wanted to show what happens inside.“ says Margit Czenki. In the recent past, those factories produced cloth and textiles. The area around Lörrach, Basel and Mulhouse used to be a centre for spinning, weaving and for finishing techniques like sanforization. There were places for Indigo dyeing and the Schöpflin mail order Head Quarters. As most of the textiles worn in Europe are now being produced in Asia, most of these factories have left the Wiese-Valley. Only parts of Europes largest cloth printing facility, the high-tech KBC, are still in operation. Surprisingly, there is another material being produced here. Not for domestic customers, however. It is produced for a continent, that many don’t even see as a market today. It is a fabric exclusively sold to Africa. 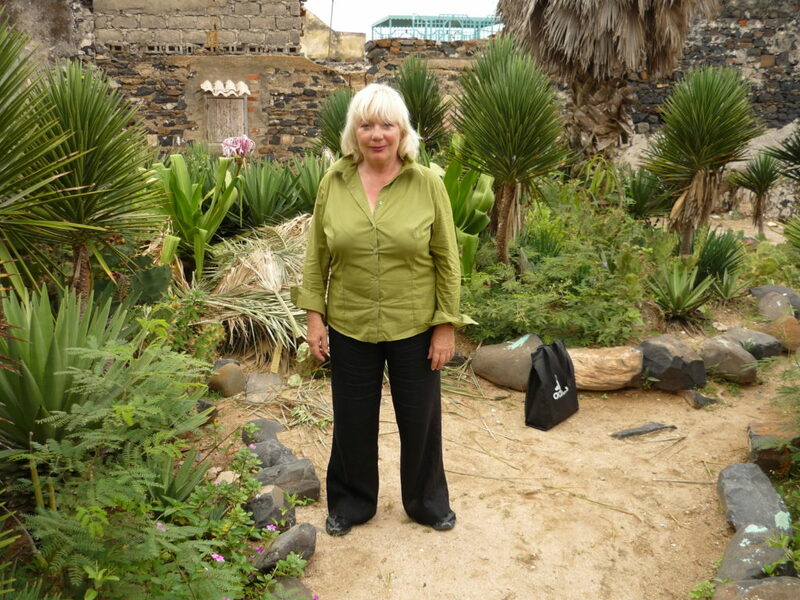 Artist Margit Czenki came across the cloth during her residency at the Goethe Institute Dakar, in Senegal. In West-Africa, the fabric is called bazin. In Europe, damask is known as a fine (and a bit old fashioned) material for tablecloth and napkins – the sort of stuff our grandparents only used on Sundays. However, people in and from West-Africa wear this fabric – and favour it for it’s stiff crunchy feel and shine. The cloth reportedly is woven in Europe, and finished in Lörrach. The white damask is then being exported to West-Africa. 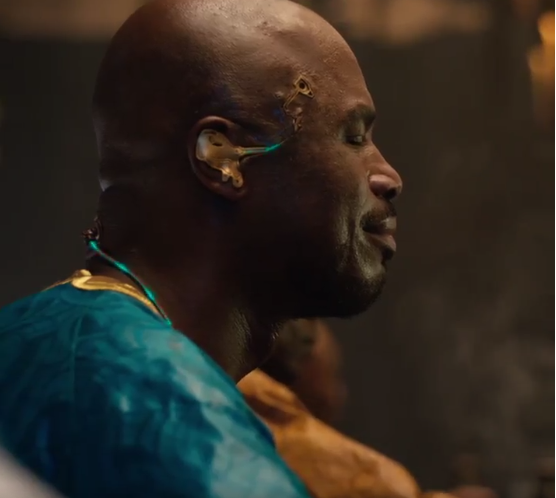 Mali is most known for it’s dying capabilities. Women in Bamako, the capital, dye and process the fabric, before it is sold locally – and exported again to other cities and to West-African communities around the globe. Some of them are famous – and seen as stars by many customers of their colorful products. The final garment is sold for a price higher than a well made, hand-tailored suit. „Hans Schöpflin has brought us into contact with American filmmaker Maureen Gosling and anthropologist Maxine Downs. They are working on a film on the Mali women.“, says Christoph Schäfer, who plans to invite the documentary film team to Lörrach at a later stage of the project. Their not yet finished film Bamako Chique: Threads of Power, Color and Culture focuses on the art and economy in Mali. Meanwhile, Margit Czenki concentrates on the white shiny pre-product Fabrique en Allemagne. Hundreds of jobs in Lörrach and Germany depend on the export of the fabric to West Africa. The Afrikadamast is interwoven with patterns, that raise many questions, concerning aspects of economic and cultural exchange, of post- or neo-colonial relations, of appropriation and exploitation: How are these weaving patterns developed? Who designs them? Where are the designs made? How does the communication between Africa and Germany work? While some of these questions might stay unanswered, thinking about the material challenges popular preconceptions of Africa-Europe relations. 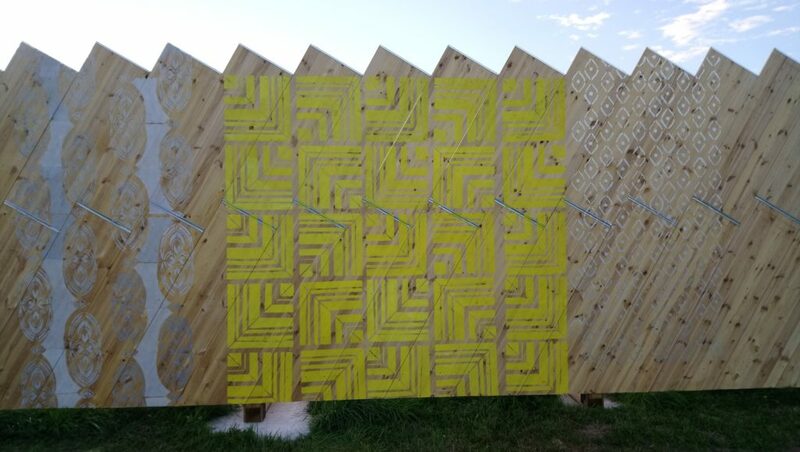 Parts of the construction fence are already filled with stencil patterns. 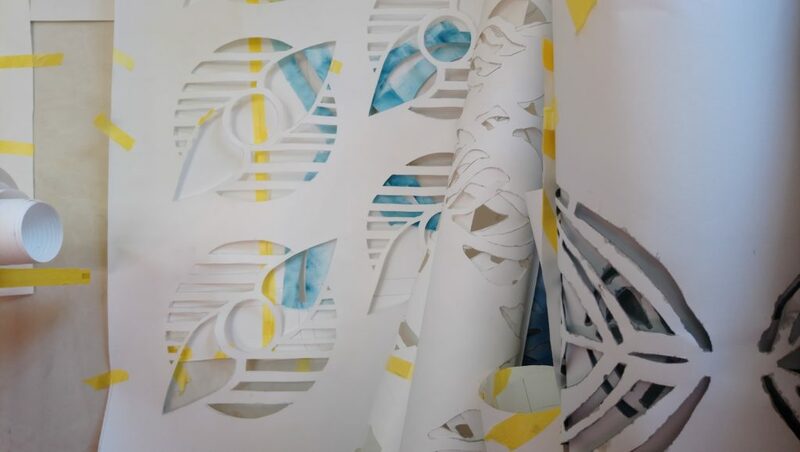 Margit Czenki decided to work with hand-cut stencils from paper, and with motives derived from the sometimes barely visible Afrikadmast-patterns. A conscious mistranslation of failed translations, or an appropriation of an exploitation – the patterns on the fence do not give away their origin too easy. 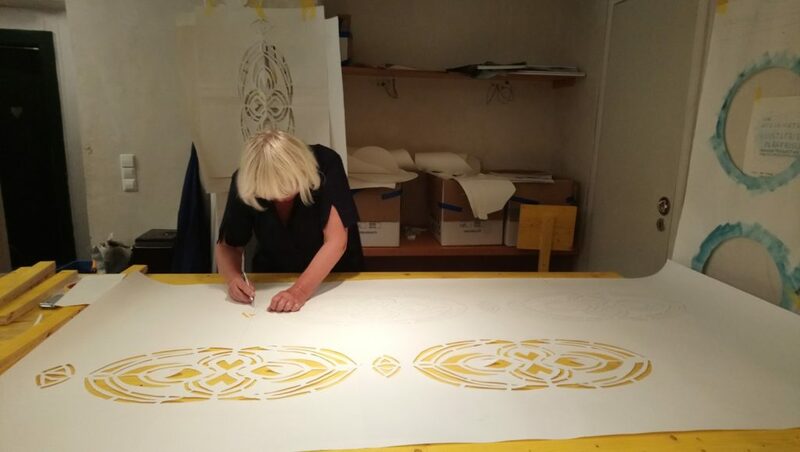 Margit Czenki working on one of the stencils for the construction fence. 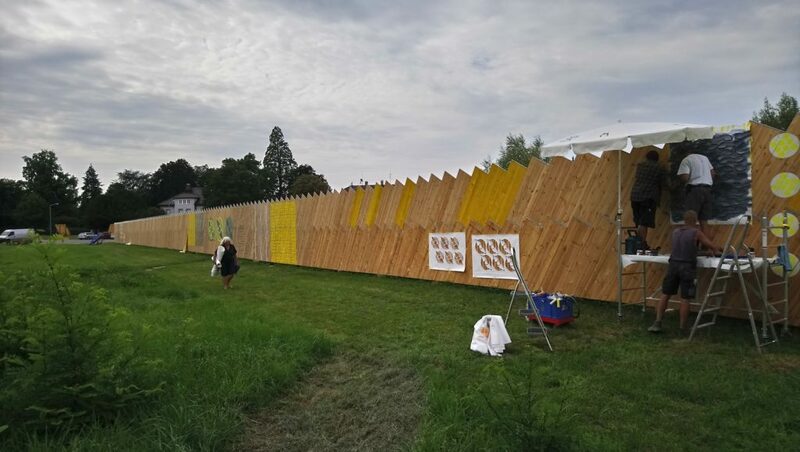 Still some hundred meters to go: For an hour or two after work, four members of SAK help artist Margit Czenki to aplly stencils to the FABRIC construction fence. Like a theater prop with a fake curtain, the construction-fence-as-ambient-artwork frames the land – and prepares the stage, where FABRIC’s production of desires can unfold in the years to come. The Team of the SAK Land & Bau (Social Work Circle – Landscaping and building) have built the fence in July. Design by Christoph Schäfer, Lisa Marie Zander, Marius Töpfer and Werner Stoll, stencils by Margit Czenki. Foto (c) Margit Czenki für Fabric – Planung als Plattform, 2017.